Plump medium-bodied dark fruits with lovely soft tannins. Note the alcohol level is a refreshing 13% unlike many wines from this region. A very tasty easy-drinking red at a great price. Available from Whelehan’s Wines, Loughlinstown. 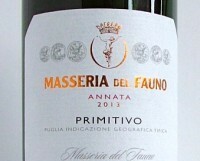 Primitivo is one of the mainstays of the Puglia region that runs along the heel of Italy. Both region and grape were relatively obscure until the 1990’s despite this being a massive wine producing area. Primitivo would probably remained in the shadows had it not been discovered that it was closely related, if exactly the same as, the Zinfandel grape of California. It has now been definitively proven that both are one and the same and originate from Croatia. As soon as the Italians found the link, they began exporting Primitivo labeled as Zinfandel to the U.S. market with some success. Puglia is very dry and hot, and Primitivo can make huge deeply coloured alcoholic monsters if desired. However, some producers now make a more drinkable restrained style of wine – such as this one.